First Hetzers entered service with 731st and 743rd Heeres Panzerjager Abteilung in May/June of 1944. Each unit received 45 Hetzers and both units saw service on the Eastern Front. and 744th Heeres Panzerjager Abteilung (1945). 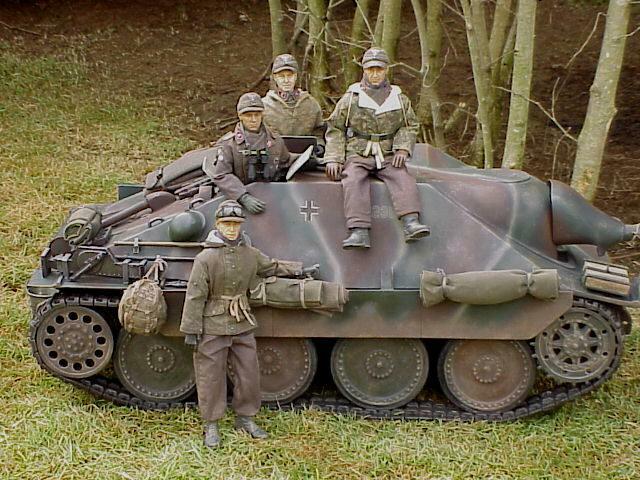 with Hetzers was 8th SS Cavalry Division Florian Geyer in September of 1944. On December 17, PzJg Abt 741 had 20 Hetzers operation<?xml:namespace prefix = st1 ns = "urn:schemas-microsoft-com:office:smarttags" />al. The 5.Panzer Amry’s objective were to reach the Meuse River once the tactical breakthrough was achieved. With its two panzer corps, they were to seize bridgeheads over the river to the south between Huy and Namur. It would then continue its attack towards Antwerp at all times protecting the left flank of the main thrust by 6.Panzer Army. Its own left flank would be protected by the 7.Army. Although normally, vehicle #235 means the fifth vehicle of the third platton in the second company of the anti-tank batallion, by December of 1944 things were far from being so predictable. 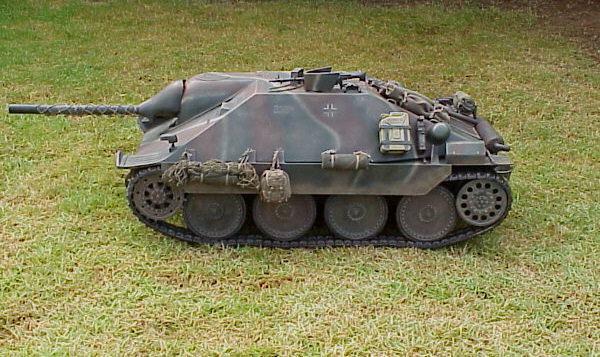 Vehicle # 235 was one of the 20 Hetzers left in their unit. Full strength was 45 Hetzers, but even under strength, this veteran tank killer unit was an important asset of the 5.Panzer Army. The 20 Hetzers of the detachment were organized in four platoons of four vehicles each. The Headquarter section, normally made of two Hetzers retained two additional vehicles as reserve. I like to give my crews and vehicles a Time and Place. The information and names are fictional but the units places and events are, to the best of my knowledge, real. He is a highly decorated veteran who began his carrer on a towed anti-tank unit in early 1942. 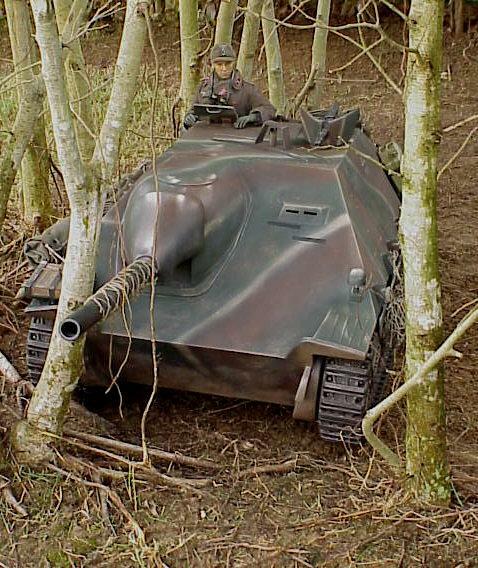 He then had been trained and transferred to a Panzerjager unit, becoming an very effective gunner in a Marder III(SdKfz139 with Russian 7.62 gun), later in the year . He distinguished himself in actions on the Eastern Front and was given command of a Marder III (Sdkfz 138 with 75mm PaK40/3 gun) by late in 1943. He was awarded the Iron Cross first class early in 1944. His heroic actions and those of the other members of Panzerjager Abt 34 had h<?xml:namespace prefix = st1 ns = "urn:schemas-microsoft-com:office:smarttags" />alted a major Soviet armour thrust, which had threatened to encircle the 34.Infantry Division in the Tscherkassy area, Eastern Front, Group South. Wounded during these actions he was sent back to Germany to recover. 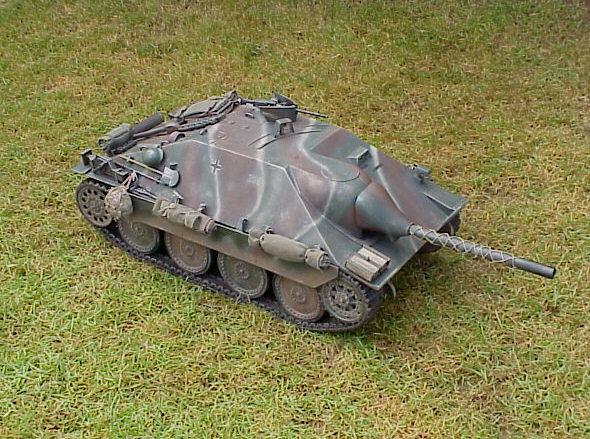 By late July he was fully recovered and was re-assigned to a new unit, utilizing the new Hetzer. This new tank killer with its sloped armour on all sides, low sliouette, powerful 75mm gun and reliable Pz38 chassis were far from spacious but the enclosed fighting compartment was specially appreciated by those veterans of the early tank-killers with their open compartments. 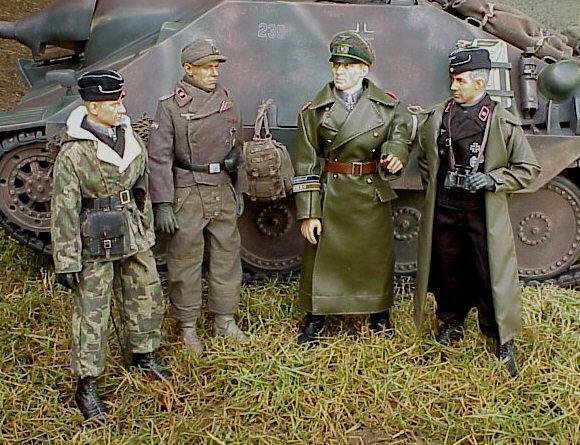 Obergefreiter Karl Cramer was a veteran of anti tank units. 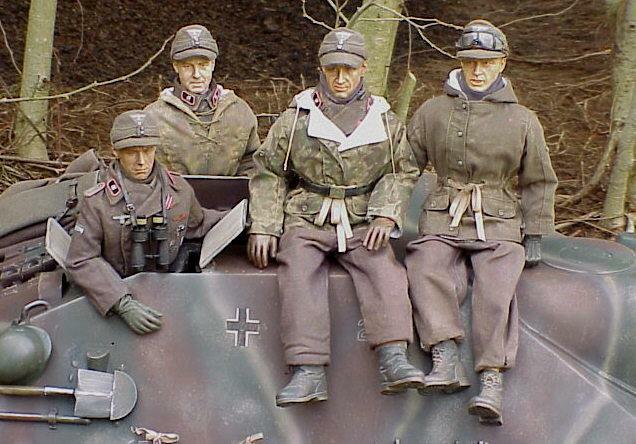 Karl served in the Eastern Front where he had been a gunner in a PaK40 unit in 1943. Early In the summer of 1944 he was sent to the Milovice Panzerjaegerschule for training in the new generation tank killer. 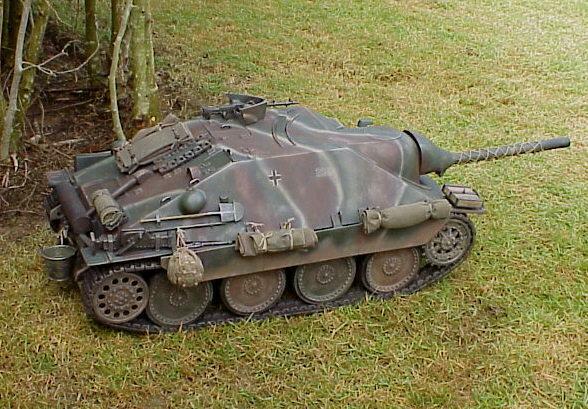 He liked the new Hetzers and was now assigned as Wendt’s gunner as the unit moved West for the Ardennes offensive. Gefreiter Christoph Berner, a veteran of the Panzertruppe, had been re-assigned to a tank-killer unit as there were simply not enough tanks to go around. Had seen major action in the Summer of 1944 and now was getting aquainted with his new comrades of PzJg741. 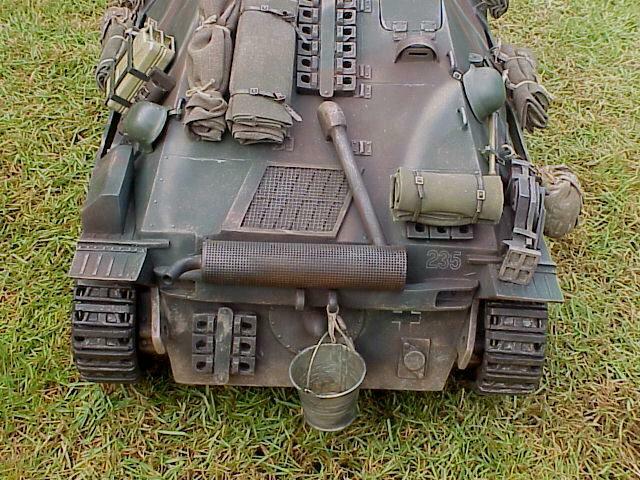 He now enjoyed tank-killer operations and as loader of this crew he felt confident of his abilities operating inside and outside of their vehicle. 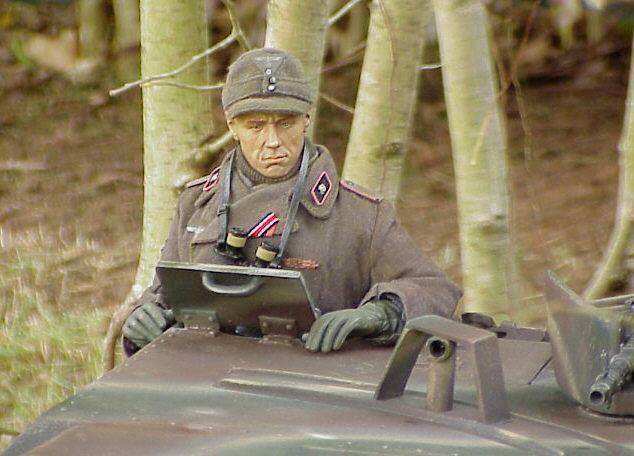 Obergefreiter Manfred Schmitt , another crusty veteran and driver of #235, had been part of various panzerjager units. He was regarded as a ‘mechanical magician’ by all the crews of the batallion. He had always enjoyed working with the various tank killers that used the 38t chassis. He wass happy to see a new vehicle designed around the trusted reliable platform. He was assigned to Wendt’s vehicle nearly two months ago. 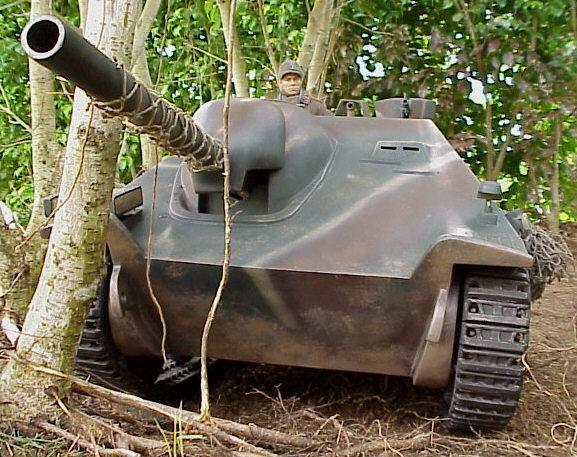 This Hetzer was made by Mardon C<?xml:namespace prefix = st1 ns = "urn:schemas-microsoft-com:office:smarttags" />allanta and I bought it second hand from Greg at Eklyps/Kriegsmachine earlier this year. The vehicle was painted and some details were added. Not sure how the bare model comes , but this one had spare track links, side skirts, periscopes and was apinted in this late war dark green, brown and buff veins. Decaled numbers(#235) and balken crosses appear to be apinted on. I liked this scheme as it is different enough and once I get several vehicles I want to make sure they are all very different from each other. The colors were VERY dark so I decided to use the colors as a base color and using dry brushing bring out the detail and weather the tank. 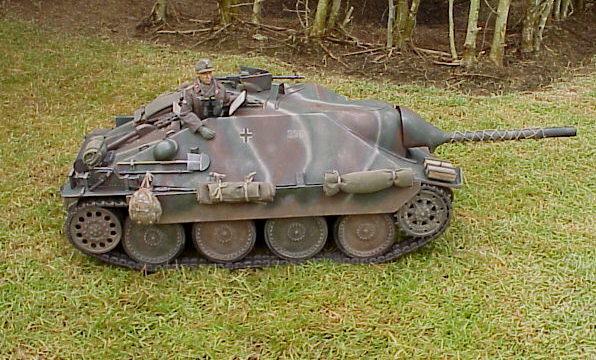 Initially this Hetzer( as anyone that saw my vehicle-less JagdPzIV crew knows by now!) 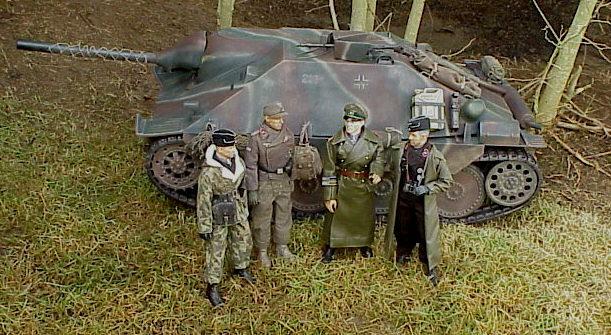 was going to be part of a SS PzJg detachment but after some research I decided to go with a heer unit. No insignia were found for this particular unit so I decided to add noe for now. If I ever find markings for the PzJg Abt 741 I will add them to the vehicle. I used Tamiya acrylics(All references to Tamiya FLAT colors) for all the painting and only used brush, no air-gun this time. I used RedBrown to dry brush the brown areas. For the dark green area I used a combination of Dark Green and Green tp bring out the details of this area. Wherever I had to retouch the light veins I used Buff, out of the bottle. Made sure not to cover the numbers or the national crosses. For weathering, I began by repainting with VERY dark brown (mixed some Black and Red Brown) and repainted the tracks. I could not figure out how to remove them so I painted them as best I could around the wheels and chassis. Used Flat Earth, Red Brown and my Black Red Brown Mix, making sure the colors were not even. I then applied some of my usual dirty wash on the wheels by placing the vehicle on its side. I then added a couple of Mike Stannard custom pieces, the shovel a fire extinguisher and a gerry can bracket. I also added one of Dennis’ (thetoysurgeon) fine jack block to the front right fender. These pieces are very very nice and add something diufferent to the vehicle. I almost replaced the jack but decided to go with the stock piece. I have a jack by Dennis and it is fantastic but decided to save it for another time. Once I was happy with the basic paint I started to weather the top area, adding different color layers of dirt and mud colors. This time around I added a couple of new colors to my mud color palette using German Grey, Red Brown, Khaki, Flat Earth, Buff, Deck Tan and White. I use A LOT of paper towels (went through three rolls on the vehicle alone) and I use a couple of sheets rolled up to mix the various colors, then clean the brush on the side and another piece of paper towel and then go to the vehicle and add the color to the areas to be weathered. I continue changing the shades of the mud/dirt and add layers and layers to the vehicle’s lower areas.. It took so long to do this dry brushing, first on the basic color, then on the weathering, that when I finished my hands were hurting (I worked for almost 12 hours straight at least half the time I was painting or dry brushing!). I then began preparing the pieces to place on the vehicle. I prepared two rucksacks (bbi), had used these before for the 250/9 and I had been able to get some more loose after that. I don’t really like them on the figures but I like how they look stripped down and weathered on the side of vehicles. Prepared two helmets with Cots liners. mAde a bundle with a camo net and several other tarps and blankets using the various pieces of fabric I have for this purpose. Used M Fisher cloth ribbon for most of them. This material is a bit wider than the regular one I ues for straps and it has a very nice tight weave construction. This material is VERY strong and it has to be. I use a small piece of material and place some cotton like material inside, then roll it up and when I tighten the strap it makes the bundle look like it does. Used some Rio Rondo leather lace on other bundles and even ther belt that comes with the bbi rucksack. I then apply a heavy dirty wash to all the bundles and let the wash dry. I then dry brush each piece and give the belts a dry brush pass with Desert Yellow, very light to bring the grain out. I then went back to the vehicle, tweaked the weathering a bit more and then began to add wear to some areas with a carpenter’s pencil I got in Home Depo. I rubbed the graphite in the edge of the idler wheel and did the same to the drive wheel teeth. I also scrape some of the graphite on my work bench and then rubbing my index finger on the graphite pile I add some wear to other areas, like around hatches, grab handles, exhaust, jack and under MG mount.. I also added weatherd galvanized pail (from Cardinal Woods) to the rear of the vehicle. I trimmed down the handles bracket on both sides and then smoothed out the edges with the Dremel. Added the blankets, bundles rucksacks to the vehicle using weathered Mfisher cloth ribbon. Added a strip of camo net to the gun barrel and tied it with some string I recently got from Blue Jacket a supplier of materials to make model sail ships. This string (surgical suture material) is sold for rigging the ship and is great. The camo sleeve can be on or off, just in case I don’t like the effect later. Most of the items used here are from Dragon. Parkas and winter trousers from Kurz/Lang. The wraps used are from Viktor and were bleached and dyed with RIT dyes to get more of a grey color. M43 caps are from Lionsheadwear with CVI insignia. All the HS washed as usu<?xml:namespace prefix = st1 ns = "urn:schemas-microsoft-com:office:smarttags" />al. Cloth items “dirty washed” and drybrushed as usual. Had some problem with the wash as it bled the wraps and the dark color stained the white camo of the hood and parka. Still not sure what happened, but apparently RIT dye and denatured alcohol do not get along well with each other. The other thisn that might have happened is that I used what I thought was denatured alcohol ina clean jar, and it might have been something else, maybe paint thinner, not sure, but if you have items dyed with RIT dye, I would avoid the denatured alcohol treatment unless the item is not on the figure. 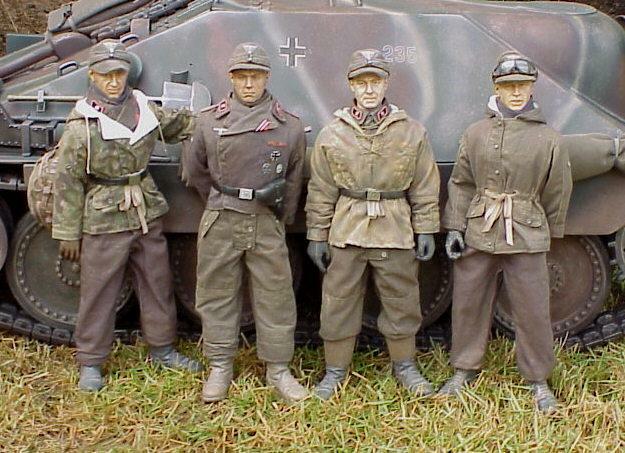 For this crew I could have gone with black wraps as panzerjager units were part of the panzertruppe and used both types of special uniform for armoured troops. I decided to go with field grey as this was a new unit and that would justify some uniformity among the crew member’s uniform. Business End of the HetzerI like this low angle shot but was not ready for it as far as the background.I did paint some leaves brown, but not the area that I needed to paint to make sure no green is obvious in the background. Might try this shot again at a later time.